Activists from the Im Tirtzu movement on Sunday hung huge signs across Jerusalem with the portrait of 19-year-old Ori Ansbacher, who was murdered by a terrorist from Hevron near Jerusalem last Thursday. 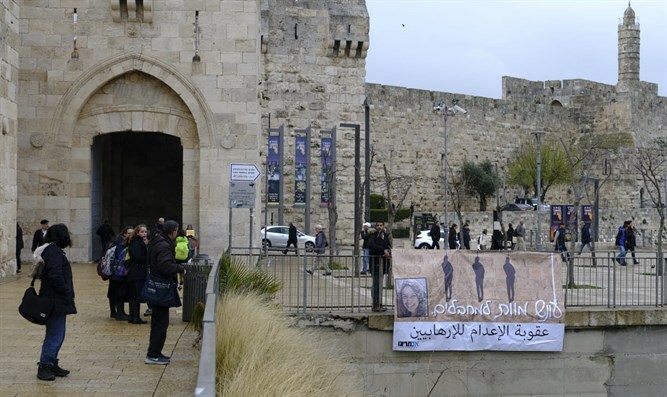 The signs were hung on the walls of the Old City near the Jaffa Gate and the Damascus Gate, on the Chords Bridge, on the Malcha Bridge as well as in Ein Yael, near the site of Ori's murder. The Im Tirtzu movement was active in the last Knesset in order to promote a "deterrent package" against the terrorists. Among other things, a preliminary reading of an amendment to the existing death penalty for terrorists was approved, which seeks to change the composition of judges who rule on the death penalty for terrorists from an absolute majority to a normal majority. Matan Peleg, Chief Executive Officer of the Im Tirtzu movement, said that "the time has come to continue to advance the deterrent package against the terror that is raging throughout Israel. Ori’s blood cries out from the ground. Without a strong deterrent package against terror, the potential terrorist has no reason to abandon his decision to go out and murder. Without expelling the families of terrorists, demolishing their homes to the ground, offsetting salaries and the death penalty for despicable terrorists who murdered innocent girls and whole families, we will not succeed in stopping terrorism."